Since the Stone Age our ancestors have tapped into the natural energies of the planet, building stone circles, standing stones, pyramids and temples in a highly evolved and brilliantly executed network of energy centers around the world. Thousands of years later, this ancient knowledge was brutally suppressed by the early Catholic Church and ignored by science. But it still lingered on, kept by such secret societies as the Knights Templar and the Masons, who designed buildings and whole cities incorporating this esoteric knowledge, hidden in plan view. Here, Cowan brings together his own extensive work with the findings of other researchers, and reveals his discovery that the energy lines emanate from volcanic sources that spew out natural telluric energies in all directions, like the spokes of a wheel! 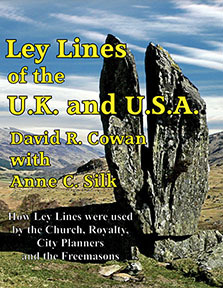 Chapters include: Megalithic Engineering; Burial Grounds across Scotland; Following a Straight Ley Line to its Source; Saint Columba and Iona; The Royal Triangle of Great Britain; The Strange Behavior of Ley Lines; The Dance of the Dragon; Ley Lines in the USA; The Secret Knowledge of the Freemasons; Spirit Paths; The Occult Knowledge of the Nazis; How to Use Diving Rods; The Amazing Power of the Maze; more. Tons of illustrations, all in color! LEY LINES OF THE UK AND THE USA. How Ley Lines were used by the Church, Royalty, City Planners and the Freemasons. By David R. Cowan with Anne Silk. 184 Pages. 7x9 Paperback. All Color. Profusely Illustrated. Index.